Discover the x-factor?the driving force behind extraordinary success. What accounts for the difference between the mega-success of Madonna and a thousand other wannabees waiting in the wings? Why did JK Rowling succeed where so many others aspiring writers have failed? And what was it about the slightly neurotic and mediocre schoolboy Sigmund Freud that ensured his position as one of the most brilliant and original thinkers in history? In this engrossing new book, Taylor builds on his theory that feeling like an ?outsider? from an early age, whether consciously or subconsciously not fitting into the norm, creates an edge that can drive outstanding success in later life. To this core philosophy Taylor adds a new ingredient: that of creativity, and he explores the interplay of these two factors?a lack of belonging and creativity?in the lives of a sparkling cast of individuals. Go beyond the glitz and glamour to discover how creative energy, harnessed to produce lives and works of extraordinary genius, can often exist against a backdrop of personal struggle and despair. Buy The Creative Edge by Brent D. Taylor from Australia's Online Independent Bookstore, Boomerang Books. Brent D Taylor has for over 20 years run a successful business in social and market research for government and large corporations. He has an honours degree in psychology. Brent has long been fascinated with extreme achievers and discovered that there was a lack of coherent explanation about why extreme achievers are as they are. 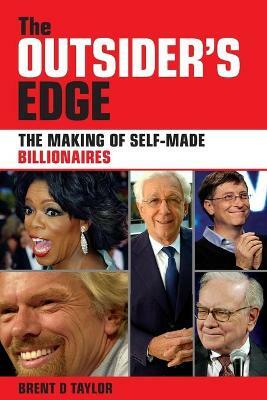 His first book on this subject, The Outsider's Edge: The Making of Self-made Billionaires, was published in 2007. He studied famous self-made billionaires, not out of a in 2007. He studied famous self-made billionaires, not out of a fascination with getting rich, but in order to understand why they got rich and others didn't. Having successfully identified the factors that lead to extreme wealth, Brent explores what factors lead people to become cultural icons in this book.